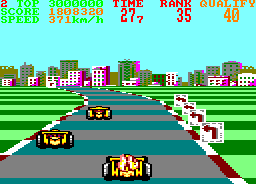 This game was supposed to be called Continental Circuits, but someone misheard the name and it ended up as Continental Circus instead – never mind. The game sees you racing on eight Grand Prix tracks around the globe with 99 other cars, and you start last. To go to the next stage, you must complete a lap of the circuit within the time limit and reach a certain position. If you crash into other cars, you'll have to go to the pits and get your car repaired, but if you leave it too long, your engine will catch fire! 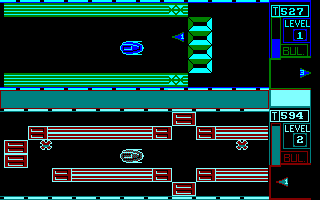 Everything – the graphics, sound and music – is excellent, and it's one of the best racing games on the CPC. The first track is tough, though. Watch YouTube videos of this game by: Axelino, ChinnyVision, Xyphoe. A mad professor has built a machine called the Contraption which is powered by golden apples, and you must collect the apples strewn around each level. You'll need to work out the exact route across each screen first, though! When you have collected all the apples, you'll then have to feed them into the Contraption to maintain it. The graphics are quite good and the menu screen is well worth seeing, although there's little to say about the sound. 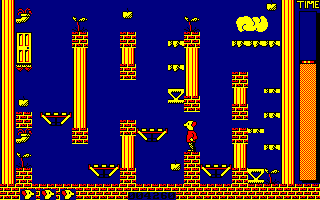 I still don't like it much, as it's just too hard – I can't get past the second level! The world is under threat, and you have been assigned to patrol a section of the inner sea and destroy enemy fighter planes, ships and submarines. A map displays the positions and movements of the enemy, and when you wish to engage in combat, you are taken to another screen where alerts are highlighted and you must select one of three weapons with which to attack, depending on the level and nature of the threat. 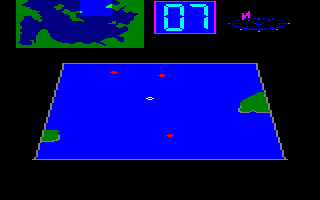 This leads to one of three sub-games – shooting down aircraft with Seawolf missiles, guiding an Exocet missile across the sea and aiming it at enemy ships, or using a helicopter to fire depth charges at a submarine. The sub-games are initially fun to play, but there doesn't seem to be anything else to do, and the game seems to lack any sort of goal to achieve. Go back to the lawless era of Prohibition as you play a lone cop in America defending the streets against the gangsters and the bootleggers. 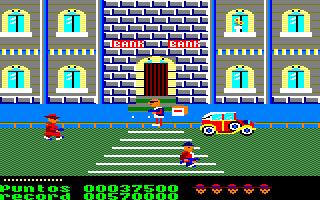 Each level consists of a single screen in which men pop out from windows, roofs and boxes, firing bullets and hurling bottles at you, which you must of course dodge. You must try to survive with all your lives intact for a set period of time, after which you will be taken to the next level. You start the game with nine lives, and you'll need them. The music on the menu is an excellent rendition of a very well known tune, and the graphics, while perhaps lacking slightly in colour, are well drawn. The gameplay is hectic and you'll need quick reflexes and a sharp eye to succeed. 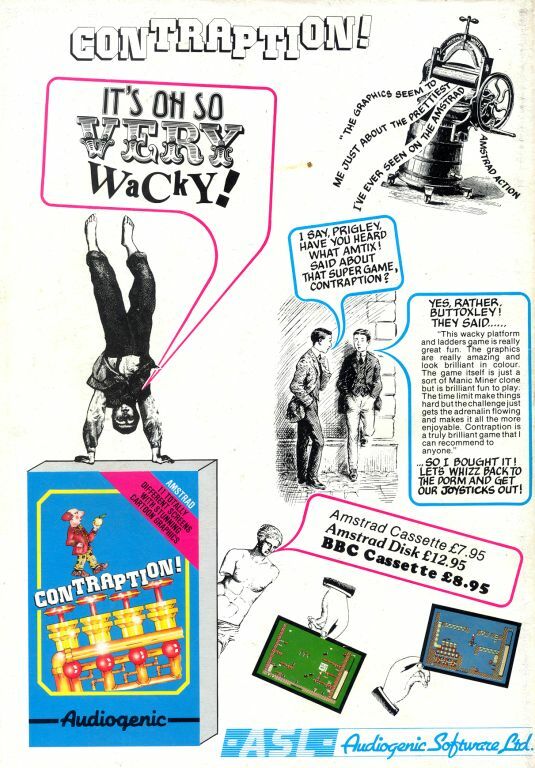 This is one of the less well known cartridge games, at least in the UK. The plot is certainly not original – it's the usual "aliens have taken over the Earth" story. 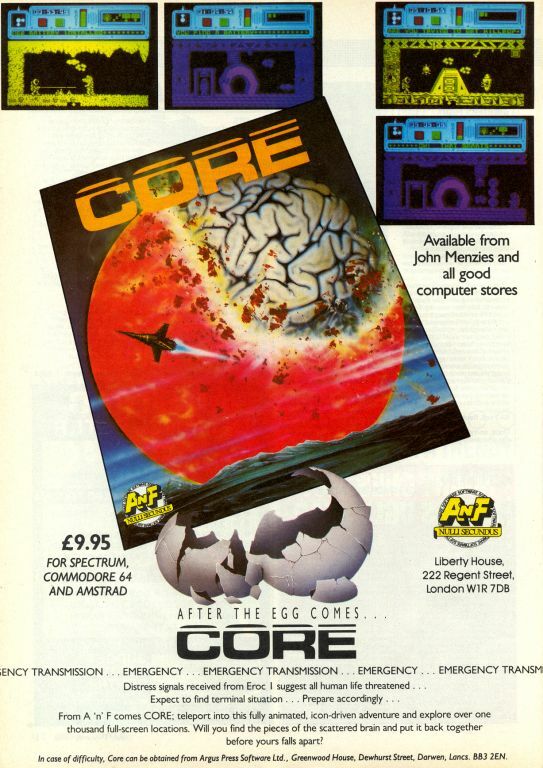 You've got the latest helicopter and have to destroy the aliens. The game is a standard vertically scrolling shoot-'em-up where you fly your helicopter left and right, shoot planes and aliens, and collect some power-ups. 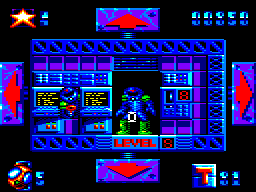 The extra facilities of the Plus are used here to produce some nice graphics, but it's a shame that the game itself is rather dull. The asteroid mining base Eroc 1 has come under attack from aliens, and all 720 personnel are dead. You, Andrew Angello, have been sent to the base to investigate what has happened. You must explore the mines and retrieve all the bio-memory units that recorded events at the base. 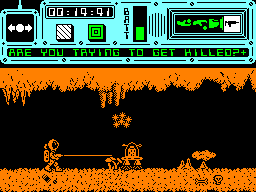 During your search, you will need to find batteries to replenish your energy, and several other useful objects, such as a metal detector and laser gun, are buried, so you must also find a spade. The mines are very large (there are over 1,000 screens! ), so it will take a long time to find all the units. Making a map is essential, but the graphics are drawn in monochrome, and one room looks very similar to the next. The icon-driven menu system for selecting commands is also extremely fiddly to use. Two players must battle it out to locate the pieces of the star-bomb which are scattered around several levels. Each level is actually a long corridor, and the parts are found at the very end of the corridors. The first player to assemble the star-bomb wins by blowing up his or her opponent. That's all there is to this game, really. To make it last a bit longer, you can configure the difficulty level and the number of pieces to collect. The graphics are ugly and the colour schemes which are used are horrible. The music, if you can call it that, is even worse! This is a really boring game which lacks action and anything which might be exciting. 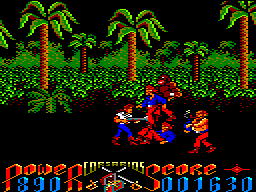 Corsarios is one of the few beat-'em-ups released by Spanish software companies. The first part is a 15th century version of Target; Renegade, where a pirate has to fight his way out of a prison and go a long way to a ship. It's quite enjoyable, but too difficult for my liking. The second part is a side-view platform game in which you have to rescue a girl before she is executed. This part is less interesting at first, but it's easier, and so you'll enjoy it for longer than the first one. And that's all; good graphics and sound, and an interesting game. Watch YouTube videos of this game by: jgonza (part 1), jgonza (part 2). Mike Bronco has been hired by the mayor of Chicago to clean up the city and rid it of the gangsters who have been terrorising it for years. The game is set in the 1920s, and as Mike Bronco, you must search nearly 100 screens to locate and kill five gangster chiefs – but their henchmen are out to get you as well! Shooting the henchmen will leave behind boxes of ammunition which you must collect, as your own supply is limited. You will probably also need to make a map, as it is easy to become lost in the city. The graphics and sound effects have a cartoon-like quality to them, and while there are some annoying niggles (such as losing more than one life in quick succession due to bombs or enemies not being erased from the screen), it isn't a bad game overall and it will provide some enjoyment. Rebels have sabotaged a mining base on one of Jupiter's moons and placed twelve pumps around the base, which will destroy it completely. This is a job for the Cosmic Sheriff – you! You must find the pumps on each of the three levels by firing at locks. Each lock displays a number, which decreases when you shoot it; if you do this continuously, you will destroy it – but not all of the locks contain pumps. 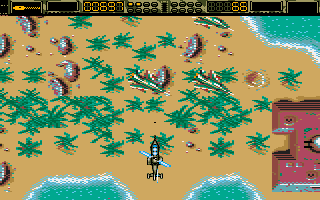 Of course, the base is filled with rebels, monsters and tanks who will shoot at you if you're not quick enough! This is a great target shooting game with excellent graphics, as one would expect from Dinamic, although there are very few sound effects and they're mediocre anyway. It's a simple yet challenging game, and thankfully it's not too difficult.